Every championship sports team and each successful business has a seasoned coach to help them navigate through some of the blind spots that we encounter in business and in life, while developing an effective leadership strategy to ensure ongoing achievements. Our Focused Fun Executive Coaching Program is designed to identify leadership strengths as well as provide an opportunity to become more effective and develop other leaders using our transformational leadership tools and techniques. Top firms such as Dell and Google have used executive coaches to help young CEOs, and legendary CEO Jack Welch has leaned on an executive coach and advisor for years. To understand how an executive coach works, the athletic parallel is useful. In sports, the coach doesn’t jump in and start playing the game on his or her players’ behalf—but the coach can provide perspective, call plays, and provide the exercises that players need to function at a high level. Similarly, your executive coach is on your team and invested in your success; he or she won’t run your business for you, but will simply provide the systems and structures you need to unlock your highest potential. 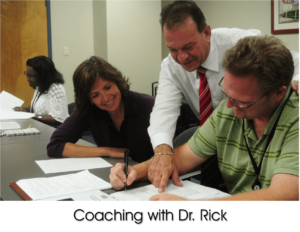 Dr. Rick Goodman is proud to offer his executive coaching services to businesses and business leaders around the world—and remember: This is focused fun executive coaching, which means it’s not only effective, but also highly enjoyable! * How to use transformational leadership to increase productivity. Transformational leaders are not dictators, but rather they are agents of positive change; learn how to harness key motivational and relational skills to get the most out of your team! * Learn to communicate effectively with team members. Communication breakdowns can cost your team time and money—in addition to the expense of morale. Learn how to be assertive, persuasive, and clear—and how to handle conflicts in a constructive manner. * Identify and utilize efficient time management and delegation processes. You only have so many hours in a day, and it’s vital that you use your time to add value to your company. Reclaim every minute of your day with our time management strategies! * Build conflict management and resolution skills. Conflict is a part of life, and it’s only natural that disagreements would happen on your team. Learn how to manage them in a healthy and positive way. * Understanding the stages of team development. Do you have a true team—or just a group of strangers who all happen to work in the same place? Discover how you can bring true unity and vision to your employees! * Develop key motivators for all team members and create a communication plan for each. Great leaders are able to customize their communication style to the individual in question. Your coach can show you how! * Learn feedback techniques that will motivate employees. Giving feedback is one of the trickiest parts of leadership. Learn how you can offer criticism that is genuinely helpful and inspirational. * How to use transformational leadership to develop other leaders. Turn your team into a group of leaders! Start developing the key leadership skills of your employees, with the help of your coach! Studies have shown, and CEOs and boards have confirmed, that seeking out an executive coach is not a sign of a fundamental problem or weakness; rather, it is a key attribute of being a superior leader. Learn more about how an executive coach can help you develop your personal leadership style, and grow your business in the process. Reach out to Dr. Rick Goodman, internationally renowned speaker and coach, today. Contact us directly at 888-267-6098 and let us design a executive coaching program that will enable you to exceed your expectations for success!